My first introduction to Randonneuring was a 300 km ride around Mt Fuji with AJ NishiTokyo on my Bike Friday in May 2012 (2012BRM519). It starts at 22:00 on a Saturday night, with a 20 hour time limit for a finish by 18:00 on Sunday. This ride offers so much variety. 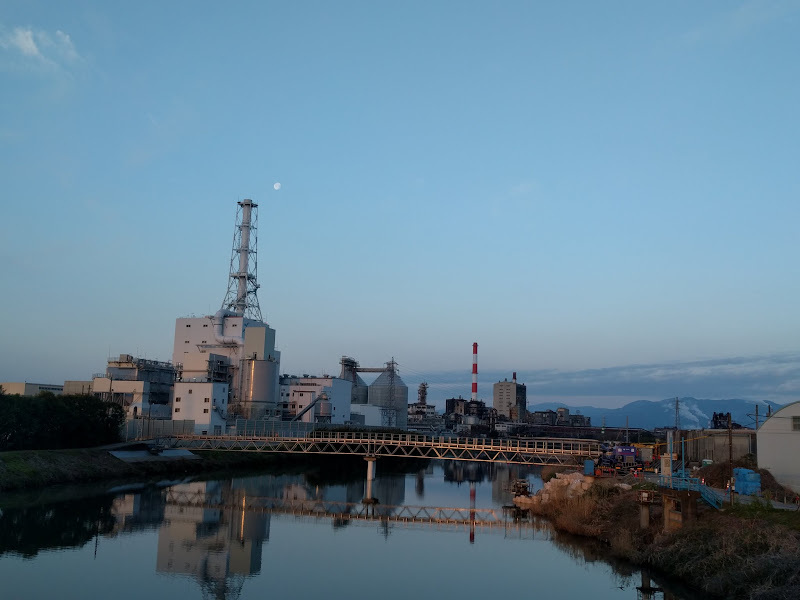 If the weather is good you get to see Mt Fuji from almost all directions, with a foreground that ranges from industrial factories to dairy pastures (and smells that match the image). Temperatures can vary as much as 20 degrees C during the ride. Lighting changes from midnight to noon, sunrise to sunset. The course includes multiple 30 km climbs and 20 km continuous descents, with elevations from sea level to over 1100 m.
This Fuji loop is the one brevet I have done every year since then, though it felt very different each time. In 2013 we got gorgeous views of Mt Fuji (2013BRM518). The next year it rained continuously for the first 150 km (2014BRM419). In 2015 I was joined by my son Shintaro, for whom it was his first brevet too (2015BRM328). For 2016 I switched to my new Elephant Bikes National Forest Explorer (2016BRM326). Last year, when I still rode the brevet on my Bike Friday, Shintaro and I took the train to Machida. Since I don’t have a rinko bag for my Elephant NFE, I decided to ride out to Machida for the start and also to ride back from the finish after the event. This brought the total to around 360 km with 3300 m of elevation gain. My intention was to get a couple of hours of sleep on Saturday afternoon before heading out to Machida, but I was still messing around with batteries for cameras, lights and USB power (for the phone and GPS) and then trying to install a Wahoo speed/cadence sensor delivered that morning when I was already supposed to be in bed. I ran out of time on the speed sensor and took it off the bike again. When I finally did lie down for an hour, I found I couldn’t go to sleep so I ended up only resting with my eyes closed. Note to myself: If you start on a Saturday night, make sure you finish this stuff by Friday night! I left home around 18:30 and headed to Machida at an easy pace. At a convenience store not far from the start I bought a bunch of bananas and had some food and rest before I headed to the registration. I made a mental note to add 28.5 km to the cue sheet distances for my GPS distance count, as this was how much I already cycled. At the start I met many friends, some of whom I meet at almost every AJ NishiTokyo brevet. I loaded up the route on the GPS and after the briefing and safety inspection we headed off. The first 39 km down to Enoshima are mostly flat and there are always other cyclists to ride with. Once I stopped at a convenience store to use the toilet, but back on the road another group of randonneurs soon showed up. We got to Enoshima before midnight and had our brevet cards signed by a staff member. In most previous years I mostly rode alone from Enoshima to Odawara, but this year I had no problem riding with other people all the way to PC1 (point de contrôle 1 = check point #1), 73 km from the start / 102 km from home, where we arrived about 01:30 in the morning. From here to Gotemba I mostly rode by myself, as I’m a slow climber. The road gains about 450 m of elevation over 30 km. There is relatively little traffic as locals are in bed and long distance traffic uses the parallel running Rt246 or Tomei expressway. 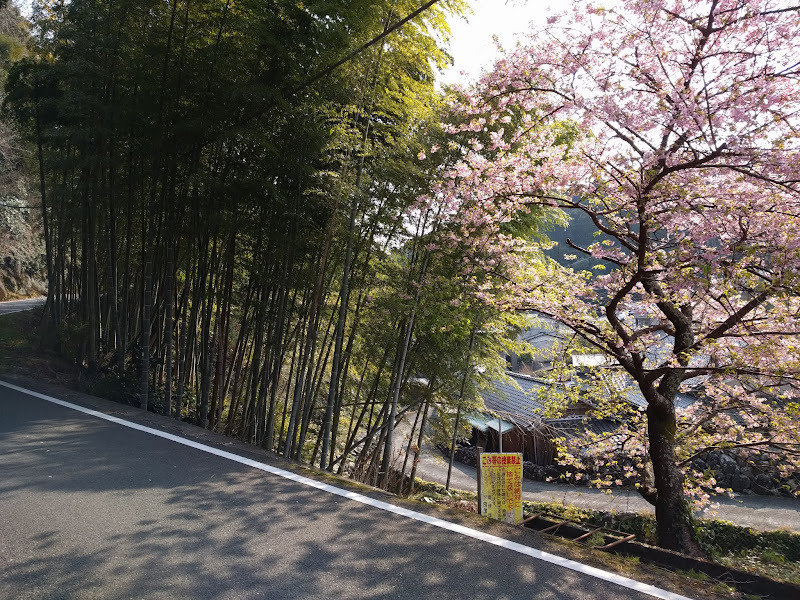 It felt great when the climb finally leveled off near Gotemba and I stopped to get changed. 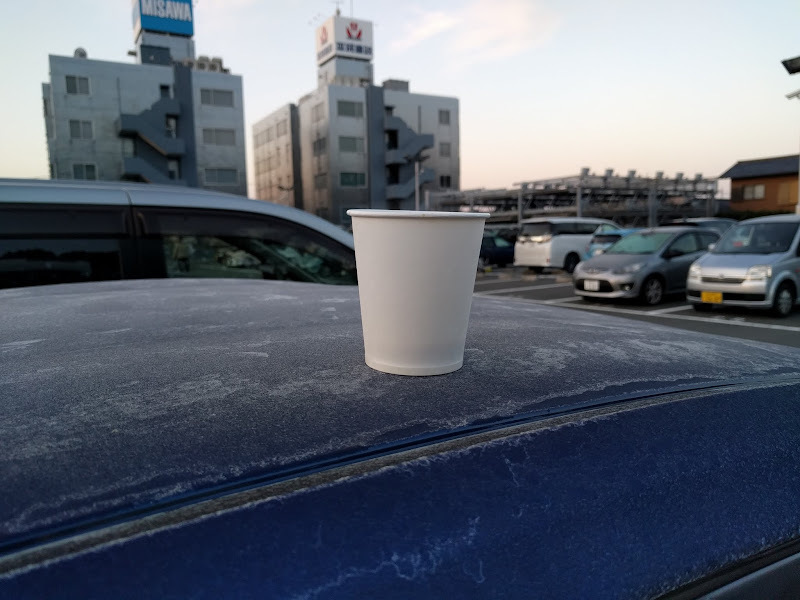 Knowing from experience how cold the early morning descent towards Numazu can be, I had brought sufficient layers. I was wearing long johns under my warm uniqlo lined trousers, plus four layers at the top: heattech underwear, Half-Fast Cycling long sleeve jersey, Bicycle Line winter jacket, uniqlo wind breaker. I wrapped a towel around my head and fixed it in place with the helmet chin straps, which kept my ears, cheeks and the chin toasty warm. The 7-11 knitted smartphone gloves are the warmest I have, more comfortable than my Bicycle Line winter gloves. I felt totally comfortable over the next 20+ km, as I was charging down towards the coast at 30 km/h and more with several other cyclists in trail. Once the road flattened out I had to take off a layer and my towel so I wouldn’t overheat. Then I chased behind another passing randonneur and drafted him until a few km before the Fujikawa bridge. The morning was beautiful as the sun came out, with the moon still in the sky on the other side. I could see snow on the peaks of the Japanese Southern Alps to the west. Mount Fuji was visible to the north, but initially only its base could be seen while the top was obscured by clouds. Gradually the clouds thinned and the still wintry top was revealed. I briefly stopped for food at a convenience store. I couldn’t really afford to take time for a sit-down breakfast at a restaurant. When you’re a slow cyclist like me you have to minimize time off the bike to still make time limits, particularly when you also take time to take pictures! Finally I crossed the Fujikawa river and turned away from the coast, riding together with another randonneur until PC2 (167 km from the start / 195 km from home). This was around 7:20, so I was about 1:45 ahead of cutoff time, but the biggest climb still lay ahead. From PC2 to the viewpoint above Lake Motosu-ko the road climbed relentlessly for over 30 km and I would burn up much of that cushion as my speed would drop below the 15 km average that cutoff times are based on. I would remind myself of beautiful view of the lake that lay ahead, plus the easy descent towards Kawaguchiko and then a long and fast one on the main road down to Tsuru, where PC3 was located. I would reclaim a lot of time again on those descents. But the real treat on the climb are the Fuji views and the quiet back country. Especially at the higher end the road passes many dairy farms so the eyes wander over green meadows, blue skies and white snow on the slopes of Mt Fuji. It was around 11:00 when I finally reached the car park at the viewpoint, around 200 km from the start and 228 km from home, to admire the view of Lake Motosu-ko. The car park was completely deserted. This time it was warm and sunny, unlike in 2014 when it had rained throughout the night and we had to descend from here in wet clothes and shoes and only a few degrees above freezing. The descent down to the main Rt139 felt relatively short now that it was warm and dry. Rt139 is not the greatest road, its surface rough and worn and there are many cars but the wide 650B tyres of the NFE absorbed the worst of the roughness and traffic was lighter than at other times I had taken it. In Fujiyoshida I met another cyclist and together we started the descent down towards Tsuru. This is a fast downhill and fun, even though it’s still a bad road with too much traffic. I had recovered a little on the descent, but still my legs were feeling worn out and it was getting more and more difficult to sit on the saddle, unlike on the Izu brevet, where I was happy until the end. I made it to PC3 45 minutes ahead of the cutoff. Knowing I had previously completed with half an hour spare at this point, I felt fairly confident I could finish the remaining 66 km under the time limit. I got more food, ate a bit and refilled my bottles, then headed off towards the Akiyama climb on Rt35, the biggest remaining climb. It passes by the Maglev test track and is followed by about 10 km of mostly descending. I like the villages and rural scenery around there, even if I couldn’t quite enjoy it as much with my sore legs and bottom. I was also starting to yawn every now and then as the effects of adrenaline wore off and lack of sleep started catching up with me. Still, it was nothing like on my first ride of this course. So I just kept turning the pedals, up and down the hills, and counted down the km and remaining minutes until I got closer and closer to Machida. On the last few km before the finish a car turning left totally ignored me going straight and cut me off, but I managed to avoid it. I rode together with three other cyclists and we pulled up together in front of the Cherubim bike shop 15 minutes before the 18:00 closing time. After having my brevet card and receipts checked, I relaxed with other cyclists and staff and waited for the remaining participants to return safely before course closing time. Then I cycled back to Tokyo, stopping at one conbini for a cup of coffee and a short 15 minute nap on a chair, since I was really getting sleepy by now. I got home safely, took a shower and went to bed. It was an amazing experience again. We were very lucky with the weather. I loved getting good views of Mt Fuji again. I’m happy with my result and very happy with my bike. Considering that unlike last year I didn’t sleep the afternoon before the ride and that I didn’t take a train to Machida but cycled to the start I didn’t make it easy for myself, but still achieved what I had set out to do. I know on the climb to the Motosu-ko viewpoint and also from PC3 to Machida I had worked much harder last year, to make sure Shintaro and I would not exceed the time limit (DNF). This year I took it easier on those climbs. I think I could afford to do that because I had done well on the flat and downhill sections to Odawara (PC1) and from Gotemba to PC2, which was made much easier by the Elephant NFE and its superior comfort from the wider 650B tyres. Next up will be BRM423 400 km around Mt Fuji, again with AJ NishiTokyo. Last year was the first time I completed that, in 26:01 (59 minutes under the limit) by not sleeping at all. I think I’ll try that plan again this year. It will hinge on getting enough sleep upfront, but otherwise I think I’m well prepared for the next adventure. 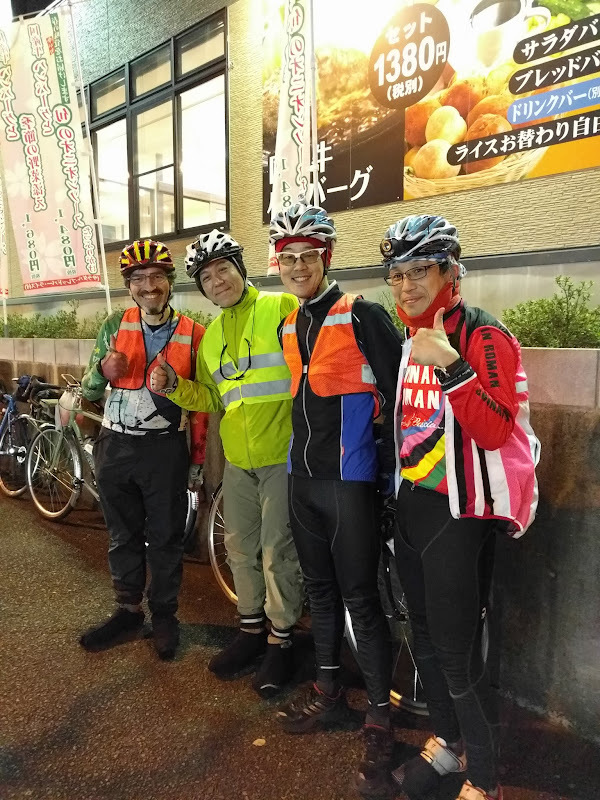 BRM227 NishiTokyo 200 km “Shiokatsuo” (BRM227西東京200kmしおかつお下賀茂コース) on 2016-02-27 was my first brevet of the new year and also the first on my new bicycle, the Elephant Bikes National Forest Explorer (Elephant NFE). Having cycled relatively little in January and February I was worried about my fitness level. Also, since building up the NFE from a frame+fork set at the beginning of the month I hadn’t put much distance on it yet. Until the day before the ride I was still undecided whether to go back to my proven Bike Friday (BF), on which I have done about 35,000 km so far or go for it on the new bike. I had done similar brevets on the west coast of Izu peninsula with AJ NishiTokyo in 2013 and 2014. For 2016, a choice of the either the 2013 (Shimogamo) or 2014 (Matsuzaki) route was offered. I went for the Shimogamo route, even though it’s supposed to have about 400 m more elevation gain. The Matsuzaki course (which I may try again next year) doesn’t reach down as far south and contains more out-and-back stretches instead of loops. I had reserved a room at the Tokoyo Inn at Mishima station, across the street from the event start, so I wouldn’t have to drive two hours before the event. On Saturday morning I was up early, checking the view outside. The sky looked completely clear. I changed into my cycling gear, grabbed a cup of coffee and some bread rolls at the hotel breakfast buffet and headed over to the coin parking where I had left the NFE in the back of the Prius. A few minutes later I rolled up to the start in front of Mishima station. The new bike got a lot of attention from fellow randonneurs. 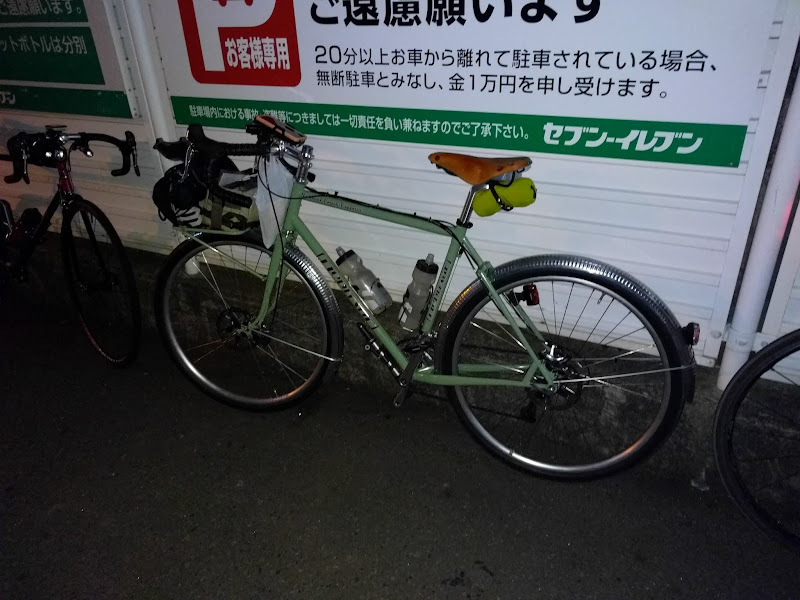 You don’t actually see a lot of “randonneur” bikes at Japanese randoneuring events and the combination of modern disc brakes with old school Honjo fenders and a Brooks saddle made the elephant an even rarer beast. After the course briefing we pushed the bikes to the opposite end of the station for the safety check (lights, bell, reflective vest? Check!) and off we went. The initial speed was even more moderate than usual at brevet starts. A large group of us hung together on the mostly flat 30 km or so until the first (untimed) check point. 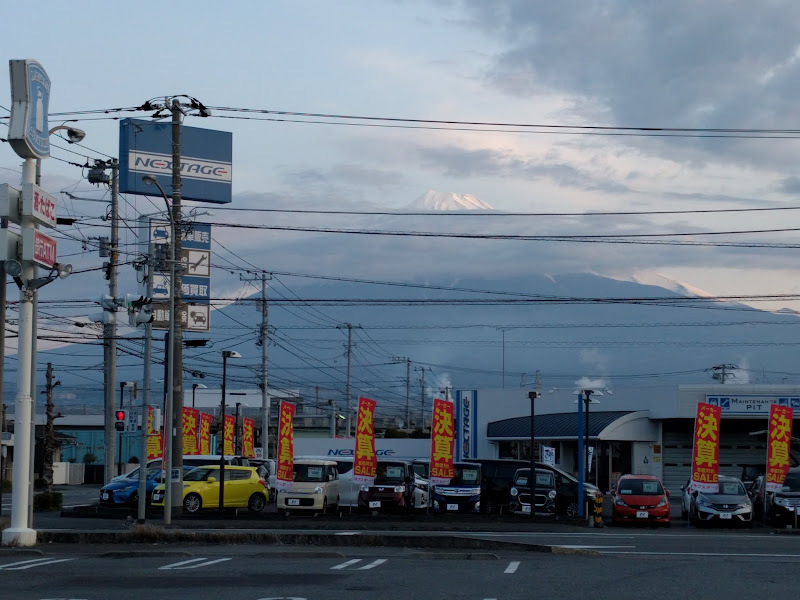 I saw my first views of Mt Fuji but didn’t want to stop for pictures to stay with the group. At the 7-Eleven I took off my winter jacket and the full fingered gloves. I did not need to put either back on for the rest of the ride, as I was always warm enough. I put the jacket into a plastic bag and strapped it to the back of the saddle. We were about 25 minutes ahead of minimum speed. From here the road climbed for a couple of km to a mountain pass, followed by a long and fast descent to Toi onsen on the coast. I felt much more confident descending at high speed than I would have been on the Bike Friday. The wider Compass Babyshoe Pass EL tyres provide so much traction and absorb most road bumps effortlessly. At the coast we got some Fuji views and I stopped for some pictures. On the way down to Matsuzaki the road passed through numerous tunnels and over many climbs and descents. The tunnels interrupted GPS reception and since I don’t have a wheel speed sensor installed yet, my displayed km count started falling further and further behind actual distance covered. I knew Strava would fill in the gaps on uploads, but I had to guess by how much to adjust the current number to estimate how far it was to the next control. The area around Dogashima is particularly picturesque. I was glad it didn’t get quite as warm as when I rode it in 2014. With my warm underwear I still sweated on the climbs, but I didn’t get quite as as dehydrated as then. 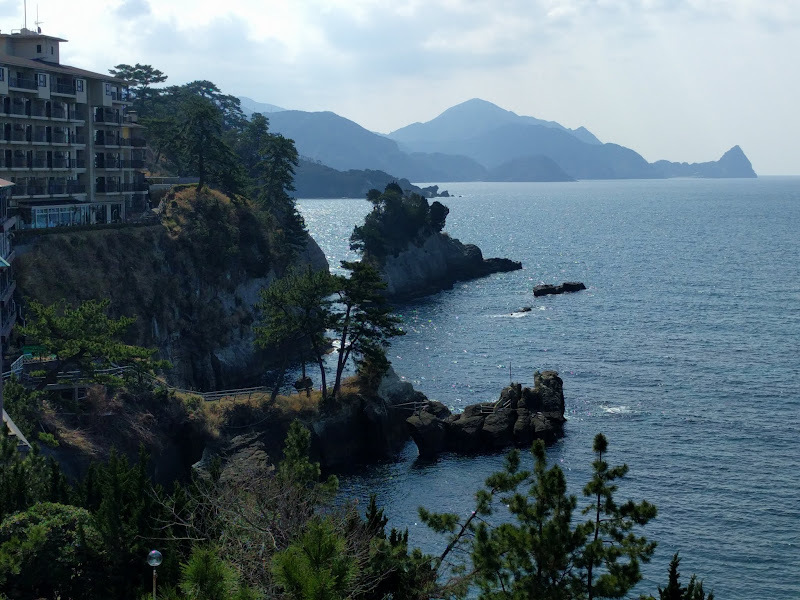 After Matsuzaki the course turned away from the coast to avoid the picturesque but narrow and busy coastal road around Iwachi onsen. 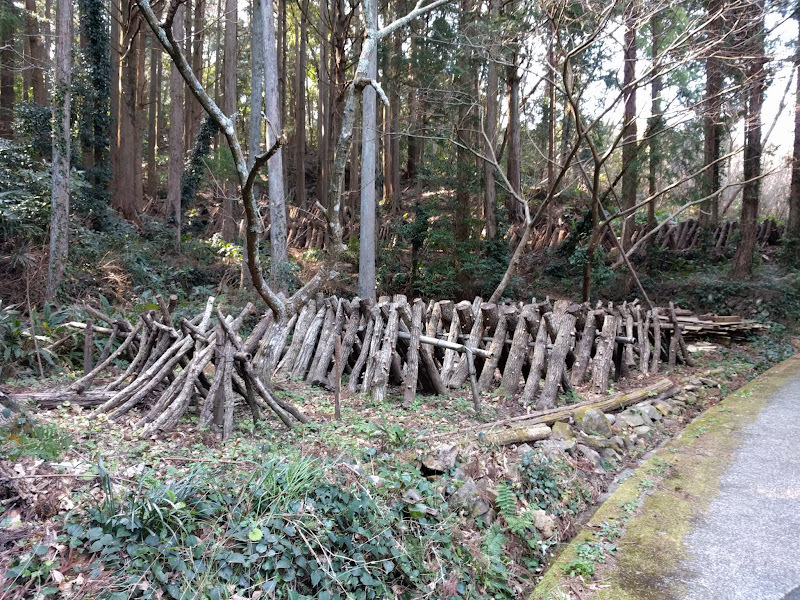 We climbed up a very steep and narrow backroad, past some farmhouses and Shitake mushroom plantations in the woods. I rode alone most of the time, but came across the same fellow cyclists over and over as we all stopped at different times to get food, take pictures or for physiological breaks. I was making good progress and felt increasingly confident about how I’d do in the brevet. By the time I got close to PC1 almost 100 km from the start and only about 15 km short of Shimoda on the southern tip of the peninsula, I was about 45 minutes ahead of minimum speed. Still, I kept all stops as short as possible and didn’t even allow myself any hot coffee, which takes too long to sip. My choice of drink was mostly chocolate milk, along with my staple food of bananas. The loop at the southern end of the course had been reversed from the first time I rode the Shimogamo course, to reduce the need to cycle into a coastal headwind. As I headed back up to Matsuzaki it was not as clear any more as in the morning. I ended up not seeing any more Fuji views in the afternoon, even in the northwestern corner of the peninsula. 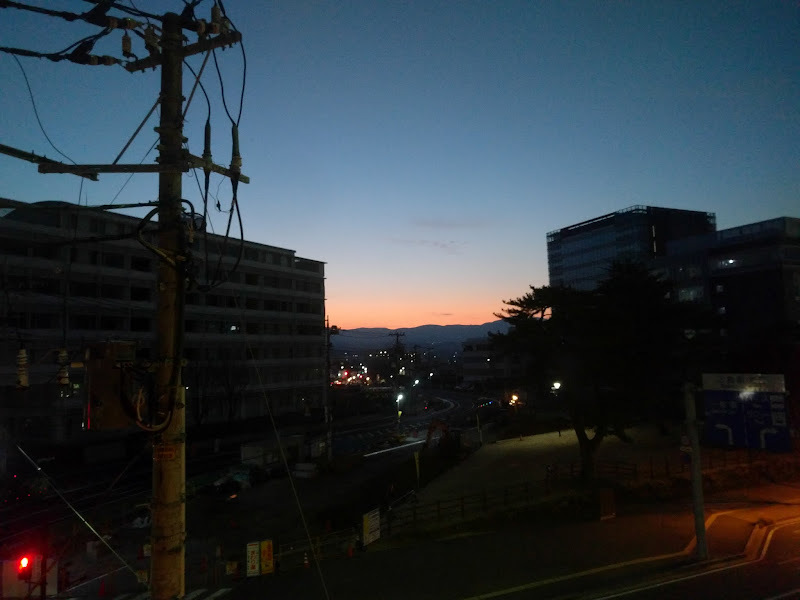 The sun was getting low as I passed through Dogashima again, then through Toi, where I stocked up on food at the last convenience stores before the sparsely populated NW corner. Compared to my earlier rides I was feeling a lot less fatigued, even though the NFE is no lighter than the Bike Friday. Much of the last 40 km before PC2 was very windy, with strong gusts gripping the bikes, but the NFE with its low trail fork is not very sensitive to that (same for the BF) and I felt safe at all times. The low trail fork also makes it easier to make quick corrections to avoid pot holes, sewer covers, etc. Darkness fell and we descended from the last big hill at the NW corner. I followed close behind another rider, with the Lumotec dynamo light flooding the road with light. We kept a pretty good pace for the next 15 km and rolled up to the Ministop at the edge of civilization at almost the same time. I was about 50 minutes ahead of cutoff time, with only 13 km to go. In a 200 km brevet you gain an extra 10 minutes of time after the last PC: The cut-off time for all PCs is based on their distance from the start divided by 15 km/h, but the overall limit is 13 1/2 hours, not 13 1/3 hours as it would be with a strict 15 km/h minimum speed. 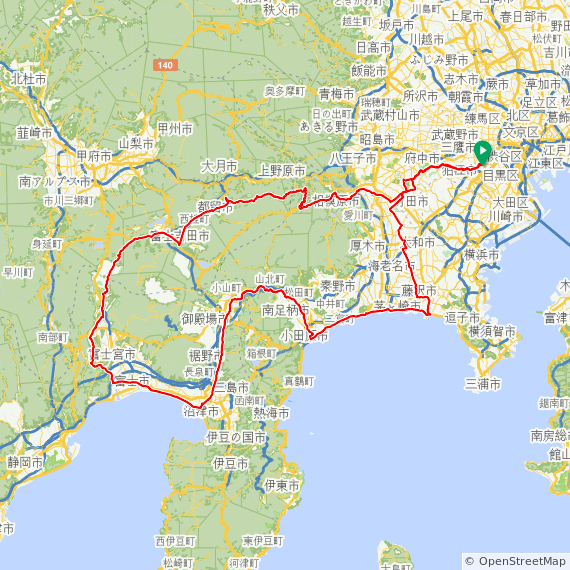 So basically I had 2 hours to cover the final 13 km — I could take it easy for the urban ride back to Mishima. While I enjoyed my coffee, a few fellow riders rolled up to the conbini. After they had also bought food and drinks and kept the receipts, we cycled back to the Toyoko Inn together, 3 km from the goal, where the reception desk was for the receipt check to confirm we had properly completed the ride. I really had a great day. I had started the ride still worried if this might be the first ever 200 km brevet that I might not finish under the time limit, but instead I improved my best time and felt great doing so. The cooler temperatures definitely helped, but so did the comfortable ride of the NFE. I am looking forward to my next brevet, BRM326 NishiTokyo 300 km Mt Fuji, on the same course around Mt Fuji that had served as a my first introduction to randonneuring in May 2012. Meanwhile I still love my Bike Friday and enjoy every km I ride on it. For courses involving train trips it probably will still be my #1 choice, as it’s easier to pack into a small package and it is still my go-to bike for rides around town. Water Abundance XPRIZE – Do the Numbers Add Up?